That might be the opening line to the classic ‘Four Seasons’ hit but even though this event wasn’t in ‘late December 1963’ it certainly was ‘a very special night’. The 158th ‘Grand Ball and Banquet’ which was held at the Macron Stadium at Bolton, was hailed yet again as an overwhelming success. 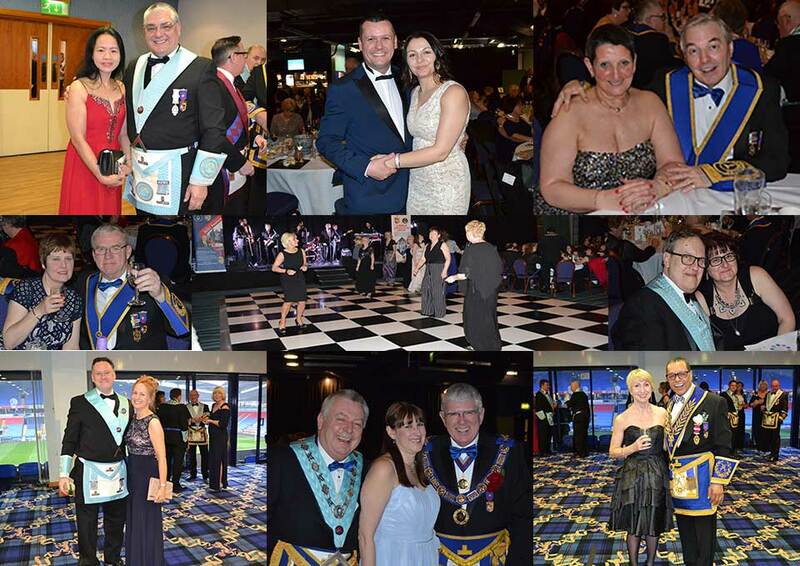 Over 500 Freemasons and their partners joined the President of the event, Provincial Grand Master Tony Harrison and his wife Maureen in another great ‘night out’. As usual, all the gentlemen wore full Craft or Royal Arch regalia, with masters and first principals proudly wearing the collars of office from their respective lodges and chapters. Guests enjoying the pre-dinner drinks reception. The Chairman and the Vice Chairman of the Ball Committee, David Asbridge and Peter Allen who are respectively the Provincial Senior and Junior Grand Wardens, together with their wives Jaine and Lesley joined Tony and Maureen in welcoming guests at the reception before the dinner. Present masters and first principals of lodges and chapters, together with their partners gathered in the Hall of Fame Suite where there was a very happy and lively atmosphere, mirrored by the many other guests who were enjoying a drink and chat in the adjoining Lion of Vienna Suite, in the company of the Assistant Provincial Grand Masters and Assistants to the Provincial Grand Principals. Once all the guests had taken their places in the main dining suite, the principal guests and their ladies were formally introduced by Provincial Grand Director of Ceremonies Keith Kemp and they processed into the hall to loud applause. A very appropriate and humorous toast was given by the Provincial Chaplain Rev Canon Godfrey Hirst, prior to the banquet being served. ‘Heathcote & Co’, the event caterers once again provided a four-course menu that met the high standards usually associated with the ‘Macron Convention Centre’ both in terms of quality and service. David Asbridge welcoming everyone to the event. With the diners happily relaxing for a short time after the excellent meal, the Grand Ball Chairman, David Asbridge welcomed everyone. He began by saying: ”Can I express my gratitude to all of you for supporting this, the 158th Grand Ball and Banquet.” He further announced that over 50 ‘light blues’ together with their partners were present and that this was a very encouraging fact. 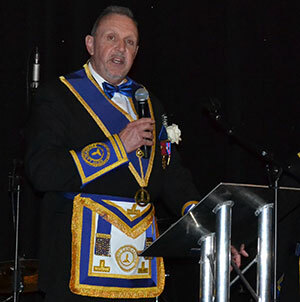 David also paid tribute to the exceptionally hard-working directors of ceremonies from both Craft and Royal Arch for steering us in the right direction, under the watchful eye of both of our Provincial Grand Directors of Ceremonies Keith Kemp and Paul Hesketh. He also gave thanks for the wonderful musical accompaniment provided by Ray Dainton during the meal. With all the tributes and thanks so amply fulfilled by David, the team of DC’s quickly oversaw the gathering of the distinguished guests onto the ‘starting grid’ of the ‘Grand March’ chequered pavement. As usual, Tony and Maureen were in ‘pole position’ and flanked by Philip and Anne Gunning on one side, with Paul and Wendy Renton on the other. As the first musical notes rang out, the march began with literally 100s of couples being led the length of the dance floor by those dual masters of choreographic intricacy, Malcolm Bell and Barrie Crossley. As the serried ranks advanced towards the stage area with the seemingly unstoppable force of a mini tsunami, our pair of ‘Strictly NOT Dancing’ DC’s inserted a deft ‘volte face’, not apparently in the ‘Craig Revel Horwood dance manual’ and averted potential disaster for yet another year! The chaos and the fun which is the Grand March! As ever, it would prove almost impossible to describe the apparent combination of chaos and precision that typifies the ‘Grand March’ but it’s undoubtedly the most eagerly anticipated feature of this annual event. The row upon row of exuberant and laughing participants, once again proved the enjoyment and fun that this march adds to an already great evening. At the end of the march, or more accurately, when the majority felt unable to ‘march’ any further the exhilarated and noisy assembly returned to their tables and the brethren were able to remove their regalia. As ever, the exhaustion and excitement were the topic of much shared conversation, well on into the evening. The band, ‘Under the Covers’ were a great hit. 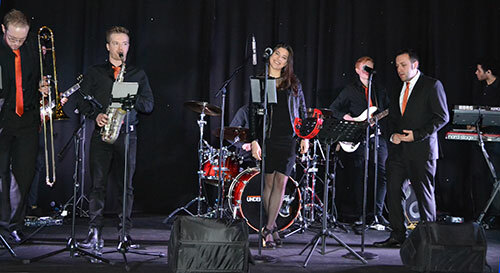 The night then moved into top gear with the band, ‘Under the Covers’, providing a popular mix of music which enabled some of those on the dance floor to prove that the Province of West Lancashire really has got the potential for enjoying Freemasonry in all its manifestations. As the night all too quickly reached its climax, Peter Allen thanked everyone for making the evening such a success and encouraged them to return in even greater numbers next year. At the end of expressing further thanks to the many contributors to the Grand Ball’s organisation, he wished everyone a safe homeward journey. For the ‘younger set’ and the more resilient ‘not so younger set’, the party atmosphere continued into the ‘wee, small hours’ with music supplied by the DJ to keep them entertained and away from their beds a little longer. A link to the many photos taken at the event by Paul Thompson and Stewart Aimson, will be included in the letter that will be shortly emailed out to attendees by the ‘Ball Secretary’ Andy Wiltshire. Camera roll from the evening.